Exporter of a wide range of products which include fenugreek seeds, indian fenugreek seed and fenugreek seed. Packaging 12.5 kg, 25 kg & 50 lbs paper/poly bags. Labelling As per buyer's requirement. Shelf life 1 year from production date. GMO Status Not genetically modified. Storage condition Cool and dry (20C). A plant belonging to the Fabaceae family, fenugreek leaves are used as a herb and the seeds as a spice. India is the largest fenugreek producer in the world. Fenugreek seeds are hard, stony, yellowish brown and angular. They have a warm and penetrating aroma, which becomes more pronounced on roasting. Fenugreek leaves a strong bitter aftertaste. It is commonly encountered in global cuisine, in preparations ranging from pickles to maple syrup. Fenugreek seeds are widely used as a galactagogue or milk producing agent by nursing mothers to increase breast milk supply. Fenugreek has medicinal value in fighting diabetes and cholesterol problems. We do not entertain Domestic requirement . Fenugreek seed that comes to you from Grover is sown on specially prepared soil. Though the plant is resistant to most infestations, it prefers full sun and fertile, well-drained and alkaline soil. It sprouts in three days, flowers in four months and the seeds are harvested about five months after sowing. The whole plant is uprooted and allowed to dry. The seeds are threshed out and dried separately for a longer time. Fenugreek seed consists of the dried ripe seed of Trigonella foenumgraecum L.
Odour and taste are typical, a bit of celery and bitter. Free from foreign odour and taste, such as mustiness or rancidity. All matter from the specific plant other than the required part. The total content of this extraneous matter shall not exceed 1%. Acid insuluble ASH 1.25% Max. Salmonella Absent / 25 gms. Packaging 12.5 kg,25 kg & 50 lbs paper/poly bags. Storage Instructions Cool and dry (20C). Packing Specifications 25 kg & 50 lbs paper/poly bags. We are the Leading Manufacturer, Supplier & Exporter of Indian Fenugreek Seeds. A plant belonging to the Fabaceae family, fenugreek leaves are used as a herb and the seeds as a spice. India is the largest fenugreek producer in the world. Fenugreek seeds are hard, stony, yellowish brown and angular. They have a warm and penetrating aroma, which becomes more pronounced on roasting. Fenugreek leaves a strong bitter aftertaste. It is commonly encountered in global cuisine, in preparations ranging from pickles to maple syrup. Fenugreek seeds are widely used as a galactagogue or milk producing agent by nursing mothers to increase breast milk supply. Fenugreek has medicinal value in fighting diabetes and cholesterol problems. Ground fenugreek that comes to you from Grover is sown on specially prepared soil. Though the plant is resistant to most infestations, it prefers full sun and fertile, well-drained and alkaline soil. It sprouts in three days, flowers in four months and the seeds are harvested about five months after sowing. The whole plant is uprooted and allowed to dry. The seeds are threshed out and dried separately for a longer time. Fenugreek methi seeds consists of the dried ripe seed of Trigonella foenumgraecum L.
Odour and taste of fenugreek methi seeds are typical, a bit of celery and bitter. Free from foreign odour and taste, such as mustiness or rancidity. We do not entertain Domestic requirements. Packaging 25 kg paper bags. 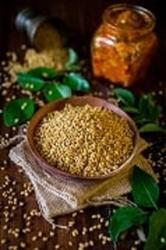 We are the Leading Manufacturer, Supplier & Exporter of Fenugreek Seeds.